People often write of singers or actors with such amazing voices it would be a pleasure to listen to them read the phone book. 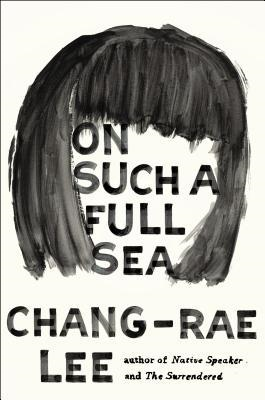 For the written word Chang-rae Lee is such a person. His words and the way he melds sentences are all so quietly beautiful the plot is secondary. He has a voice of astonishing grace and range. This is not to say that his newest novel, On Such a Full Sea, is the literary equivalent of a phone book. Far from it. It is that this is not reading to be rushed. The sentences are as important as the plot. On Such a Full Sea takes place in a world that is both strange and strangely familiar. Over a hundred years into the future many American cities have collapsed under the weight of disease and debt. At the same time, huge Chinese cities have become unlivable due to air and water pollution. The solution, as decided by a shadowy Association? Move the Chinese population as laborers into the now abandoned American cities. Fan is a teenage girl whose life has been spent in the safe environs of B-Mor (formerly Baltimore), a city that raises fish and produce for the wealthy residents of the Charter villages. Her job is to take care of the massive schools of fish being raised in tanks. She spends the majority of her days underwater, where she is most comfortable. It is only when she decides to leave B-Mor to find her boyfriend and long-lost brother that she discovers many of the truths she has been fed since childhood are false. In this way Lee turns the world upside down so that life in the worker settlements is not a labor camp but merely a well-structured society in which one’s physical needs are met from birth to death. There are no scenes of beatings, starvation, or punishment. Life is highly regimented right up until retirement when each worker is given the choice of any location they want for a once-in-a-lifetime trip. In today’s economic environment where employment-for-life is an antiquated theory aspects of Fan’s world do not sound so bad. At worst, life is mindlessly routine and disobedience is a foreign concept. I finished On Such a Full Sea at 1a.m. It is not my practice to write a review without allowing time for a novel to coalesce in my mind but this is a rule-breaking book. Much happens in the novel but it pales in comparison to the inner journey of Lee’s characters. If they were sitting in a room, not moving, they would still resonate with all the raw questioning of humanity and yet, there is nothing florid or overdone in On Such a Full Sea. It is the muted call that strikes deepest. The novel carried me along with Fan until the last two pages when the ending became clear. It was not what I expected or wanted and like a spoiled child I was angry and bereft. I don’t believe in divulging endings so won’t elaborate but like the guileless Fan, I wanted things to go my way and that’s not always how it works. Even in my disappointment at the outcome, On Such a Full Sea is a work of infinite and haunting grace. The quiet elegance with which Lee assembles each sentence grips the mind. He writes of homes and streets that resemble places we may know and yet, without glamour, imbues them with a depth that goes far beyond what the eye sees. The fact that it does not end as expected may speak to Lee’s larger thoughts about life, not only in this odd, dystopian future but where are today. This sounds really fascinating. I’ve begun to see it pop up here and there, and I’m pretty sure it’s one of those books I won’t be able to resist. I’ve been seeing this one pop up in stores and online. I was wondering about it. It sounds pretty good. I’m putting it on my list to keep my eye on. The more I read about this, the more I think I would like it. I’ve been hit or miss with dystopian lately, but this seems like it would hit all the right notes. I’m with Andi. I’ve seen this popping up and have been wavering. Your review has tipped me. Oh my gosh, I feel like I have to reply to all you wonderful reading women! I just read another review of this book that completely slammed Lee’s writing style. This person hated the book in no uncertain terms. I’d love for each and everyone of you to read and if you hate it, please let me know. It sounds incredible – and unique. Great review! This sounds incredible. I’m a bit nervous about dystopia, but you’ve convinced me that I need to read this book! Looks like readers either love or hate this one, but based solely on your beautiful review, I’ve put it on my list, Catherine. I’m all about the language, and if this one has it, I want to read it. That seems to be the case, Cynthia, but as a writer I think you will find it as mesmerizing and elegant as I did. If I’m wrong- let me know because maybe I missed the whole point! I keep hearing good things about this one… will have to get my hands on a copy sooner than later! Sounds like a fascinating read and I love when the writing takes the story to a whole different level by itself! What an amazing metaphor to use to compare a singer to the author. I NEED to read this now! It’s all over the place, too.